Kate can't bear to watch innocents suffer, but the solution she and Curran have found threatens to be even more painful. The European shapeshifters who once outmanoeuvred the Beast Lord have asked him to arbitrate a dispute - and they'll pay him in medicine. With the young people's survival and the Pack's future at stake, Kate and Curran know they must accept the offer - but they have little doubt that they're heading straight into a trap . . . It's taken me a long time to get my thoughts together enough to write this review, Magic Rises took me on such an emotional roller coaster that there were times when I couldn't tell up from down and I was exhausted by the end of it. That happy kind of exhaustion where you have cycled through so many different types of emotion but are left with a huge smile on your face, where the highs were only as high because you plunged into the lowest lows but you've finally made it out the other side and lived to tell the tale. I have become such a huge fan of this series over the last couple of months, I've devoured all of the books and short stories and I've loved every minute of it. Each time I finish a book I'm convinced that Ilona Andrews can't possibly top it but with every new instalment they consistently manage to. 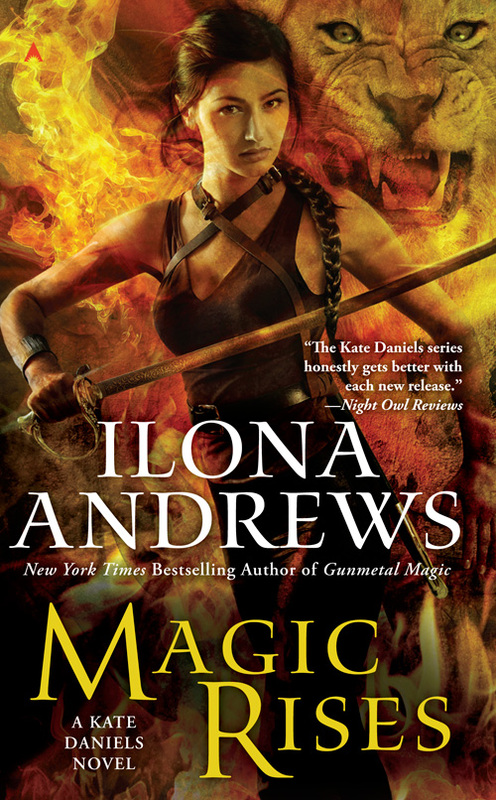 I'm not going to lie there were things in Magic Rises that I absolutely hated, things that made me so angry I wanted to throw something, but in spite of that I loved every single page of this book. There aren't many stories that can inspire such rage in me but then turn around and make my heart melt, have me bawling my eyes out one minute and clutching my sides with laughter the next. Magic Rises does all that and more and for that reason alone I'm going to have to say it's my favourite book in what has hands down become my favourite series. For the first time we see Kate and Curran venture out of Atlanta and travel across the seas to Georgia because Curran has been asked to mediate a dispute between three European packs. It's not something he's looking forward to, in fact he's pretty sure it's a suicide mission because he's had dealings with these packs before and it didn't go well the first time, but they are offering the one thing they know he can't refuse - panacea. The European packs are the only ones who know how to create the medicine that can save the lives of young shapeshifters who are on the verge of going loup and they have promised to pay Curran with it if he resolves their dispute. Both Curran and Kate will do whatever it takes to protect the youngest members of their Pack and they aren't afraid to put their lives on the line to do it. I was quite excited to see Kate and Curran in a different environment, especially when I found out they would be taking most of my favourite characters with them - Derek, Andrea, Raphael, Doolittle, Aunt B, Barabas, Saiman and a few less familiar faces too. We even get to meet Jim's sister Keira who I have to say I hope we see more of as the series continues. I knew it would be interesting to see them all out of their comfort zone, especially Curran who is so used to being in charge and for everyone around him to immediately follow his orders! What I wasn't expecting was the strain it put on Kate and Curran's relationship. Some of Curran's actions made me absolutely crazy, even though I knew he had to have a good reason and was sure there was some kind of plan he was acting on I was so mad at him I couldn't see straight. I wanted to climb into the book and punch him on the nose on Kate's behalf and to give her a comforting hug at the same time. My heart broke right alongside hers and I hated seeing her hurting so badly. As mad as I was with Curran I was thrilled with the way Kate's friends rallied around her, she has come such a long way since the beginning of the series. From that loner who kept her distance from everyone to someone with friends and an adopted family who she loves deeply and would die to protect. It was great to see that they also have her back and that they'll even take her side when Curran acts like an arse. I will say that Curran went a long way towards making up for his behaviour by the end of the book. I'm still mad at him but I understand the reasons for doing what he did. He knew that he was risking losing Kate forever but he went ahead anyway because it was the only way he could see of keeping her safe, he loves her enough that he would rather risk seeing her walk away from him than to let anything happen to her. I still want to see more grovelling from him in the next book but I have high hopes that they're back on the right track. I don't really want to go into any details about the rest of the story so I'm just going to tell you that there are some extremely interesting new characters, shocking twists, a lot of action, fabulous fight scenes, moments that will break your heart and others that will make you feel all warm and fuzzy inside. Basically it's everything you'd expect from Ilona Andrews and this series but to the power of 10. Magic Rises is hands down the best book in the series so far and it will turn you into an emotional wreck while you're reading it. Clear your diary before you start reading because you are not going to want to put this book down for a second! I don't know how I'm going to survive the wait for Magic Breaks. I so loved this one, a new really great book as always! I love this series soooooo much Melliane! Every single book just gets better and better :o) How are we going to survive the wait until the next book though? !